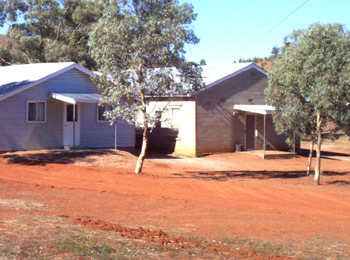 Willow Springs Shearers Quarters, Self-contained accommodation, ideal for your next family get together holiday. Click on the photo on left to go out the back and on right to go inside. Click here to view the Campfire ring, Decking and BBQ area. - Click here to view the floorplan. Rates charged are worked out per number of persons per night, as shown in chart, except if this total is less than minimum booking amount per night. Willow Springs is approximately 21 Kms North of the Wilpena Pound or 71 Kms NE of Hawker. 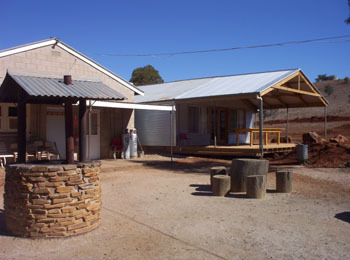 The Shearers Quarters are masonry buildings which have 11 bedrooms. Each bed has one quilt, one blanket and pillow but no linen. Hired linen includes sheets, pillow case and towels. Dining room has an open fire place. Common room has gas heating. The kitchen has gas and wood stoves, microwave and electric refrigerators. Ordinary household items such as crockery, cutlery, cooking utensils are supplied. Separate mens and ladies bathrooms with 3 showers in each with separate laundry facilities. A BBQ-campfire area is at the rear of the buildings and across the yard is the toilet block. 240 volt solar/diesel power is generated on the station. The system does not support the use of heaters or large appliances.